Happy 2013 from Sunnyhills - Still The Best Taiwanese Pineapple Cakes! Now that Christmas is over, we're all looking forward to a festive new year! We had an early peek at Sunnyhills pineapple cakes new year packaging - this is what it is going to look like! All gloriously swathed in vivid vermillion and yellow. On the cover is a whimsical snake drawing forming the "2013" with the four founders stacked up as "1". These are still the best Taiwanese pineapple cakes I have tried. They taste of real fruit, and don't have any artificial pineapple fragrances that are present in some others. I also love the buttery crust that holds firm the generous filling. These cakes are baked in Taiwan and airflown to Singapore. Go visit the cosy store at Raffles Hotel Shopping Arcade #03-05 and be entreated to their amazing hospitality (each visitor gets a cup of oolong tea and piece of pineapple cake). 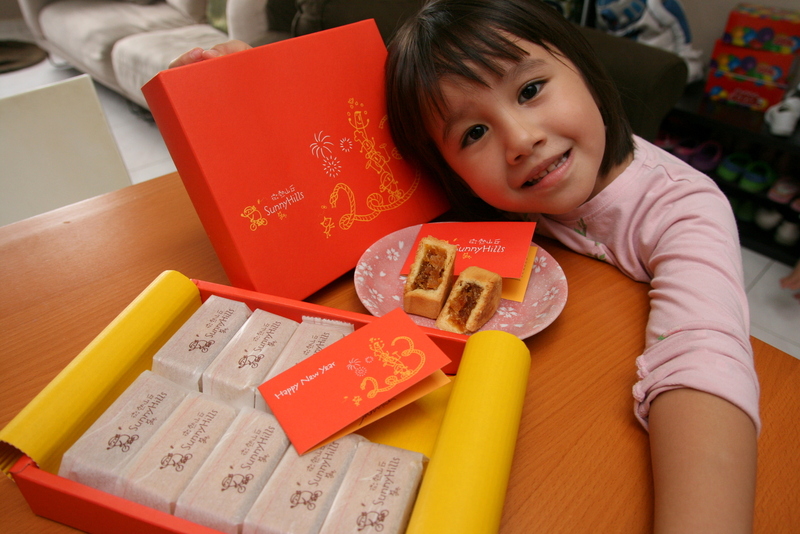 These pineapple cakes make great gifts when you go visiting for Chinese New Year (CNY). The buttery pineapple cakes resemble gold bricks, so these are perfectly auspicious. Inside, the pineapple filling captures the goodness of the sun (I have seen the sunny slopes of Nantou where the pineapples are grown). The sweetness also aptly lends a 甜甜蜜蜜 connotation (fantastic wedding favour too - way better than any slice of fruitcake). The CNY gift set will be available two weeks later from 10 January 2013, but I'm sure you can pre-order. Email your queries/orders to service@sunnyhills.com.sg or call/send an SMS to +65 8522-9605 (10am to 6pm). Hey long time no see! Glad you think so too about Sunnyhills!